It's Facebook Fridays! for April 7, 2017, Spring is in the air, wedding bells are ringing, and it's time to think about serious relationships! The Lucky Mojo Curio Company is holding a random drawing to give away 9 ideal love-drawing Adam and Eve spiritual supply prizes to bring in your naturally-suited partner. 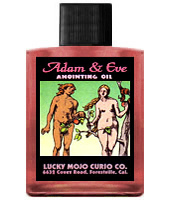 This week each lucky winner will receive a bottle of hand-made Lucky Mojo brand Adam and Eve Dressing Oil to anoint their third eye, throat, wrists, behind each ear, and "you know where," in their quest for true love. First thing tomorrow morning, we will select NINE winners at random, announce their names here, and ask them to message this Facebook Page with their mailing addresses, so we can send them their FREE Adam and Eve Oils. We have a winner! In fact, we have 9 lucky winners! Our Facebook Fridays! winners for April 7, 2017 are: Zhana Levitsky, Shanna Talley, Lia Kelly, Annette Lanniee, Cynthia Love, La Viola Ward, Jake Richards, Heather Nijoli Robinson, and Daneka Vallejo-Perrault.